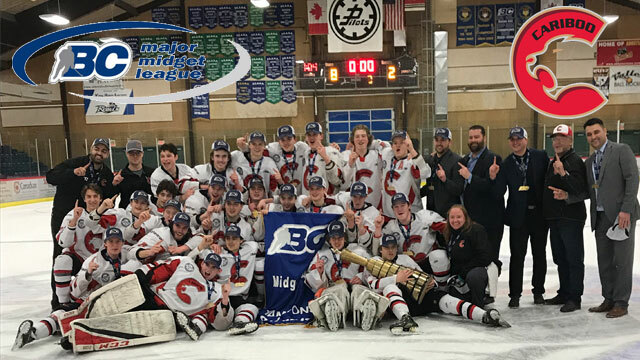 The Cariboo Cougars captured their third BC Major Midget League championship on the weekend, sweeping the Fraser Valley Thunderbirds in the best-of-three Final. Cariboo won 3-0 on Friday and 8-2 on Saturday, winning their second championship in three years. Last year it was the Thunderbirds beating the Cougars in the BCMML Final. The Cariboo Cougars Head Coach Tyler Brough is a Prince George Cougars’ alum, as he suited up for the Cats for three seasons (’96-99). The Cariboo roster also features two Cougars’ prospects in defenceman Matthew Magrath and forward John Herrington. Cariboo will now face the Calgary Buffaloes, the Alberta Midget Hockey League (AMHL) champions, at the Pacific Regional Championship, April 5th-7th in Calgary. The winner of that series will earn a berth in the TELUS Cup, Canada’s National Midget Championship, being held April 22nd-28th in Thunder Bay, Ontario.